with Hogwarts rising in the distance. talking portraits on the walls, live action newspapers, indoor snow, and the sorting hat. We were paying so much attention to the details, that we forgot to pay attention to this. When they say that the ride may cause motion sickness, they aren't kidding. The teacups are child's play compared to this ride. This ride bends you sideways, frontways, backwards, and upside-down maybe. I couldn't keep track. If my stomach had been in my pocket, it would have landed on the floor. I confess to closing my eyes for half of the ride to minimize the impact. But the kids loved it. They really loved it. They were frightened by the dementors, whomping willows, and dragons but they weren't at all put off by the topsy-turvy shaking. What is it about kids and getting dizzy? They throw up on airplanes and cars but they laugh their way through the tilt-o-whirl. My favorite part of Harry Potter World was frozen, edible, and sweeter than a newborn babe. Frozen Butterbeer, my friends. It's a cousin to a rootbeer freeze with whipped cream, but the flavors are butter, toffee, butterscotch and vanilla. The taste is dazzling. The line is horrendous. Don't wait in it. Find one of these servers milling around and give them cash. They will be back momentarily with this. And you will be in butterbeer heaven. I've been playing around in my kitchen, trying to bring you a good copycat. Some recipes combine butterscotch ice cream syrup with cream soda and vanilla ice cream. It's a good shortcut and produces good results. But the from scratchy, caramely, butterscotchy syrup is better. Be sure to put your cream soda in the freezer until it's slushy. A true frozen butterbeer should have little bits of icy soda. Make the magic come to edible life at your house tonight. Cheers! 8 scoops vanilla ice cream Place your cream sodas in the freezer about 30 minutes before you plan to have butterbeer. (This recipe takes about one hour because of cooling time.) In a small saucepan over medium heat, combine the brown sugar and water. Bring to a gentle boil and cook, stirring often, until the mixture reads 240 F on a candy thermometer. Stir in the butter, salt, vinegar and 1/4 heavy cream. Set aside to cool to room temperature (about 30 minutes). Once the mixture has cooled, stir in the vanilla extract. Meanwhile, in a medium bowl, combine 2 tablespoons of the brown sugar mixture and the remaining 1/2 cup of heavy cream. Use an electric mixer to beat until just thickened, but not completely whipped, about 2 to 3 minutes. To serve, in the bowl of a blender, combine about 1/4 cup brown sugar mixture, 1/2 cup cream soda and two scoops of vanilla ice cream. Blend until smooth. Pour into glass and add additional cream soda to fill to the top. Stir with a spoon to blend. Top with whipped cream mixture. Repeat. Yay! Looks like a great place. I have flame tree barbeque ribs in the oven right now....and I'm making a shopping list for butterbeer. Sigh...cheaper than a trip to Orlando I guess. 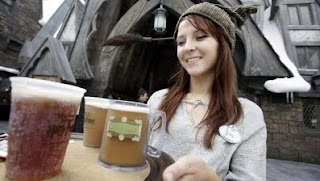 I was already dying to go just to see Hogwarts, and now I want to ge even more for the butter beer! :) Cute pictures too. I'm going to have to try the Butter Beer, it looks delicious! Wow, the magic comes to life! I had no idea that someone had gotten around to bringing the food of HP to life as well though:) What an amazing experience, the rides sound fun but the recipe even funner (?) thanks for sharing, my mouth is watering Pru! Wow.These look AMAZING. And my boys would love Harry Potter World (okay, Jared and I would geek out a little, too!) Can't wait for the right time to make these. You did it! I was wondering how you would duplicate a soda. My friend just went to Harry Potter World and Disney and said the butterbeer was their favorite treat of the trip so I am dying to try it. I am also really excited to go there. I think Harry Potter World is what pushed my desire for a Florida trip over the top, since there is nothing like it in the CA parks. We are going in July, can't wait to see everything. It's a surprise 16th birthday present for my son. I know we will have to try the butter beer. Any tips for us while we are there? Thanks for posting this recipe! I'm planning to make it for the premiere of the last Harry Potter movie. We went in October & LOVED it! We died over butterbeer & came home & chose the exact same recipe and thought it was about as close as we could get to the theme park original. We've made it every time my son has finished another Harry Potter book and drank it while we watched the movie. For frozen, we've just put the concoction (well, half of it) into our Cuisinart ice cream maker for 20 minutes. Wonderful, slushy, frozen butterbeer! See my butterbeer post here: http://www.ratetheplateutah.com/2011/06/eat-in-butterbeer.html . We tried out your recipe a few months ago and really liked it! :) A couple of weeks ago we got to try the concoction at Harry Potter World. It definitely hit the spot! I kept thinking of your post while we were there! What a fun trip this must be to take the kids on. Sounds like quite an adventure. The butter beer sounds quite interesting. Thanks for the post and recipe. Can't wait to try and make some Butterbeer! Just went to HP World a couple weeks ago. The guy I bought some from mentioned Nilla wafers in the topping?!? Not sure how but might need to play around with it! ,942 jobs available in southgate, mi on indeed. Haslett if youre old enough to remember the cartoon. You must have a cdl to be a truck driver in michigan. Only verified, open positions at top companies. Find sales, finance, medical, retail, customer service, and management jobs on ebay classifieds detroit. Clinical informatics specialist borgess health michigan. is remixed by wordpress jobs created by design disease. Juju makes your dowagiac job search faster and more comprehensive. I'm really very grateful to you bring us such a good blog experience. Thank you for your sharing. Philippine pili nuts from the Bicol region in the Philippines is a great Filipino or Philippines food orsnack. Pili nuts are very healthy and nutritious indeed, being a source of energy, potassium and iron.They also have protein, dietary fiber / fibre, and calcium as well as monounsaturated and polyunsaturated fats. I know they have no cholesterol, no trans fat, and the unsalted ones have no sodium. What is great about the pili nut snack or treat is that they are so crisp, rich, and delicious. I am heartbroken all the text is gone on your recipes. I get on here often and remember how wonderful you and your recipes are :( I should have printed everything that I liked out!